A construction trailer is set up across the street from the future Residence Inn site at approximately 600 South Salisbury Street. Could we start seeing site clearing soon to make way for the new hotel? Hat tip to the RalCon commenters for pointing this out. Yes, but don’t expect to see much activity until January. 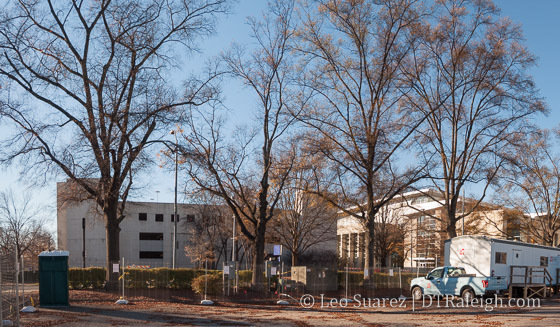 I was just admiring the great trees on this site and noticed (again) that there aren’t any trees along Salisbury Street behind the Marriott. Does anyone know why? @CX, I’m guessing because of the underground structure. Same w/the bare sidewalks along Cabarrus between Salisbury and McDowell. You can feel the ground bounce when a big truck rolls by. Heritage Properties bought 0.8 of a acre @ the corner of Hillsborough / Glenwood Ave. across from Snoopy’s Hot Dogs for $4 million . That lot is zoned for up to 12 stories . Heritage said that they would make a project announcement next month , per The N&O ! They also said it would be 10 stories: office space with ground floor retail. I’d be happy with the 12 max, but that’s a fine height for that area! Bummer that it’s not residential. If ever there was a property that would make a terrific splash back into the condo market, that’s it. The East views from that location toward DT can hardly be beaten. Is the property sold on the west side of Glenwood or on the east? If it’s on the west side, at least there’s still hope for across the street. I’m happy to hear about all these potential developments. However, doesn’t it seem like the projects downtown take so long to get started? It seems like when a project is introduced in North Hills, it gets built very quickly. I’m still waiting on The Edison office tower, Charter Square North and Union Station. @John, I assume since Dwight said it’s across from Snoopy’s, it’s the southwest corner of Hillsborough/Glenwood Ave, where the “HealthSource” building is. The address is something like 605 Hillsborough St. The parcel across the Glenwood from *that* (the southeast corner) is so small and narrow between the RR tracks and Glenwood that I’d think it’ll take a while before someone tackles that when there are easier-to-use spots available. You’re right about the unbeatable views looking east, I used to live across the street between Snoopy’s & Char-Grill and loved the view more than anything. Sounds like a nice project for that property. I’m thinking something Charter South size maybe. Would be surprised at that price they wouldn’t use the whole 12 story limit. How did you get $4million for that parcel? Tax records show it sold for $700,000 and closed 12/16/15. $4million for that corner doesn’t make sense since the entire block across from Camobell Law sold for $6 million. Uncle Jesse , This info. was in Saturday’s N&O. That’s all I know ! Everything I’ve read indicates they plan on a 12 story building. Also, we might see a quick turnaround thanks to the new zoning! I believe the total amount of $4M and 0.8 acres is for the assemblage of the combined 4 eastern most parcels of that block. A 10 to 12 story building will help pull Bloomsbury Estates tower (~8 stories) more into the mix. This area between Citrix, the Holiday Inn, Quorum, and West at North is ripe for more infill. Good to see SOMETHING tallish get started over here after ‘the Hillsborough’ and ‘Lafayette’ never got going. @KenAA, I completely agree. One has to wonder if the land along West and Harrington between Peace and Morgan will see its potential. I’m hopeful that something will be ignited by the new bridge work at Capital and Peace and the new park at the sanitation parking lot. Other than this high profile area, there are still tons of potential sites in DT to infill. The triangle business Journal is stating in the story released at 5 o’clock today that the John Kane/Dillon project should start construction in January… Has anyone seen any more renderings? no new renderings but demolition starts next month with project completion 2017. don’t expect much in terms of changes to the renderings that have been seen to-date. hopefully, all the other developers can move as swiftly as Kane. Page 2 of this shows a small glimpse of the Dillons higher floors! Or 12 stories simply due to topography. Anytime you’re thinking one and you get two 20 story buildings is a great thing! We’ll see something taller one day. I don’t know that this would be the ideal spot for a 40-story building at this point (though I would be fine with it). I do think it is annoying that the 20-story guideline is limiting this potentially. However, the bright side is that we get two buildings, they are actually using the maximum and not building something 12 stories, and that this should hopefully sail through approvals and get built faster. Otherwise, I picture the usual NIMBY objections slowing this down immensely. I heard the charter square north tower is going to start in February. Just what I heard from someone I know in the construction crew. Steve , This sounds great ! I hope for this in February ! What kind of article came out giving the info. on the two tower Lundy Project ? Thanks for any info. that anyone may have ! Dwight, TBJ ran a story yesterday but you have to have a subscription, which I don’t have. Thanks so much William ! I don’t either ! “So Proud Of Seeing All Of These Future Projects” ! Hopefully The N&O site will have a 30-40 story project ! Happy New Year To Everyone ! And we have a Dillon rendering. I realize that is one rendering from one angle, but damn, that is ugly. @ William! Thanks for the information and link! Any idea how tall? From the rendering it looks to be low 200’s maybe? Daniel ,I think that city planner Vivian Ekstrom told me that The Dillon Tower would be 223 ft. tall . “If my memory is right” ! Dwight,any word on the Edison? Passed by the site today. Isaac’s is closed and cleaned out. Looks like demo is around the corner. With all the upcoming projects,downtown will be very different soon. It looks like many of the projects will be going up at the same time. Hopefully there will be cranes everywhere soon. Btw I like the Dillion. Walked thru the Warehouse District today. Excited to see the Dillion and Union Station transform the Warehouse District! Adrian , All I have heard is there was a meeting between the city & the Edison management last month that was very confidential & the info.could not go beyond the closed doors. Actually, it could be very good. A closed meeting more likely means the city and developer are potentially close to an incentive based deal for a company that is moving downtown. The current Dillon proposal is an improvement over the previous design which was too monolithic. I like what’s been done with the South elevation with terrace and “sky window”. I wonder if the East side (which will be in view from many vantage points downtown) is similar to West elevation? I hope something a bit more exciting has been done there. Hopefully a rendering will be released soon showing detail from other side of building. Trying to stay optimistic about the Edison tower, but given the scalebacks and delays for the rest of that block it’s hard. I did notice Isaac’s moved out, but I’m confused why Reliable Loans is still there when construction was supposed to start when Skyhouse was finished. As far as the Dillon, it isn’t the most gorgeous building, but it looks damn interesting. The N&O article definitely helped me appreciate what they’re doing. It will be a huge deal for the Warehouse District too. About the Edison, maybe someone had a vision and realized that adding 10 more floors while you have the chance would boost it with the “big boys” dt instead of just another 19 story building that really won’t make much of an impact on the skyline. I like the design just wish it were taller. The Dillon looks GLORIOUS! I am most excited for (beyond all the ground floor retail space) that “5 story multi-media wall” they mention- that sounds cool as all hell. I like William’s thought (^^above my comment)- I would be absolutely, perfectly fine with delaying the Edison another year- even another 2 years- if it means we can get something even a little bit taller. LOVE the look of the Edison, but even with just another 10 floors it could make a huge impact on the skyline (from certain angles, at least). And then: Two 20 story buildings on 300 Hillsborough, a 12 story building at the top of Glenwood south, the 22 story Charter Square north…. Raleigh is certainly starting to get serious about taller buildings. Definitely gives me hope that the N&O site could see an actual skyscraper when they get around to building up. Dillon at 223′ would put it around the same height as the circular Holiday Inn on Hillsborough, or around the size of Charter Square. But since it is out in the warehouse district, it will seem taller. FWIW and this may be nothing but according to Wake County IMaps 307 S. Wilmington (Reliable Loans) is not in the hands of “Edison Land LLC” as are the adjoining parcels making up this part of the block. Could the owner of Reliable Loans possibly be a holdout? Reliable Jewelry says they are moving to the end of their block in 2016. Presumably in one of the Edison apartments ground floor retail spaces. So it doesn’t seem like the office building is being held up. In order to have a significant impact on our skyline, a building needs to be about 30 stories. When viewed from afar, the Raleigh skyline has three buildings – PNC, BB&T, and Wells Fargo – the only three above 30 stories. I would love the Edison office tower to be delayed in order for a higher structure. It may make me forgive them for the atrocity that is the Edison apartments.